It is with great sadness that the family of Rebecca Jewel Garcia announces her passing at 69 years old after a brief but valiant battle with brain cancer. Rebecca (Becky) was born in Marked Tree, Arkansas on October 17, 1949 to Aubrey and Priscilla (Vigil) Griffin. Becky and her five siblings were raised in Los Gatos, California. She is survived by her brothers Robert, Aubrey and Alan, and two sisters, Priscilla and Viola. Becky was a free spirit who moved about the country with her children in-tow. She preferred quiet mountain towns and called California, Colorado, Oregon and New York home. 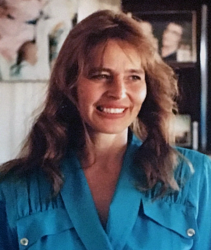 In 1980, she embarked on a cross-country journey to visit relatives in Las Cruces, New Mexico. She quickly fell in love with the beautiful Caballo mountain range, bought a home, and settled in. In 1984, Becky married the love of her life, Julian Garcia, and together they worked to raise their 8 children. Becky was a devoted mother who had a unique and special bond with each of her children: Shawn (Tannen), Sabrina (Gary), Fonta (Vic), Bridget, Vishna, Amber (Justin), Breanna and Kaitlin. Becky realized her true passion when she became a grandmother. She loved pirates and treasure chests, mud puddles, and lots and lots of candy. She devoted her life to children and spent countless hours providing love, care, and guidance. She will be forever remembered and deeply missed by her grandchildren: Shelby, Hunter and Garrett; Hannah, Levi and Nathan; Odessa and Diego; Julieann, Richard, Lucas, Adalena, Aracely, Robert and Brooklyn; Mikaela, Mariah, Brett, Ashley, and Lauren; Orin, Chantry, and Cassady; Dominique and Messiah; and Michael. Services will be held on Tuesday, December 11, 2018 at 1:00 P.M. at the Church at the Butte in Elephant Butte, New Mexico with Rev. Joe Byers officiating. Rebecca will be laid to rest at Hot Springs Cemetery following. Sendng sincere condolences to your famiy for the loss of Rebecca. John 5:28, 29 gives us hope of a resurrection in the near future when we will be reunited with our loved ones again.